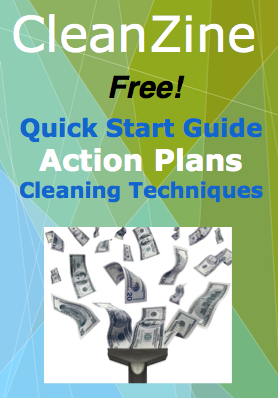 There are a gazillion different things to consider when starting your new cleaning business! Some of these I'm sure you've thought of. The obvious ones come to mind, such as choosing a cleaning business name, deciding which services to offer and accessing the business forms you will need. However, most of what you need to consider is not so obvious. That is why 80% of new businesses fail. They commit the fallacy of the obvious. Usually through a sense of overconfidence or through a habit of self reliance, the start up newbie thinks they can figure it all out on their own, and that is sometimes possible. It works about 5% of the time. The other 15% did make some attempt to get educated. They bought a book or two, or interviewed a couple of experienced business owners. What are the not-so-obvious points? The points you have no experience with. How do you know what to look for when you have no experience with it? Did you know that most clients do NOT decide whether to keep you based on your cleaning skills? Not really, it's not difficult to do a good job of cleaning. It is vital, but it's not the main reason they keep you around. What is the main reason? It is always because they feel comfortable with you in their home. If they do not, you are gone, even if you are the world's best cleaner. This is a powerful bit of information to have. I mean that instead of over-fixating on how well you clean, pre-qualify clients so that you have a good functional fit, so you both like each other and want to work with each other long term. At that point you can focus on getting them to relax and feel comfortable with you. Another wrong assumption most beginners have is that all your clients want the cheapest deal. The cleaner with the lowest rate wins, right? Wrong. In reality, they win the client that no one should want. But is that not everyone's main goal, to get the best deal? No! Read here about how not to project your values on to your client. Do not assume that your clients have the same value judgments and opinions as you. That is the worst thing you can do. You will not pay $25 per hour for a house cleaner, so why would anyone else? Fact: far more people than you will ever need will pay twice that. You should even think twice about the business name. In the age of the Internet, you need to have a name that works in that domain, not just on the side of your truck. You have to weigh a name you like with one that will perform well on Google, Yahoo, Bing and Facebook. If you live in Barnesville and you can get the name Barnesville Custom Cleaning Services, then you should do it. It may be more fun to have JR's Awesome Cleaning Co. But the words JR, awesome and Co. will do you no good online. Barnesville tells Google where you are right in the URL. Cleaning and service are the most common search terms people use when looking for a cleaning service. The word custom indicates that yours is an elite service that will attract the clients that can afford you. What about the slogan? We have all seen funny plumbing truck slogans, right? "We're #1 in the #2 business," "Always keep your wife in hot water," "Schitt happens - Schitt Plumbing," "Your $#*! is our bread and butter." Well, they may be amusing, but these slogans tell the client diddly about you as a professional. Slogans such as those attract blue collar, middle class clients who will always try to nickle and dime you. That is fine, I have no problem with that, but my method aims to bring you $30+ per hour for cleaning houses. If it is going to be funny, it must also be informative. The most popular cleaning business slogan is "we do not cut corners, we clean them." It addresses a primary fear of the client, i.e., that you will cut corners. So it does double-duty. It relaxes them and assures them that you will not cut corners. But being funny can backfire. Better to be witty, not outright funny. Play it safe. You can bust them up at the bar after a day's work. Our slogan was designed to trigger a certain type of client and to attract them. It had nothing to do with cleaning. At the time, we lived in a town with a highly educated population. Our slogan was, "to be happy is to make others so," followed by the author's name. Our slogan tells people, "we put you first," and that we enjoy doing so and it shows that we are thoughtful people because we know who Bertrand Russell is. We wanted to attract kind, rich and educated clients. The most common question from new cleaning professionals is, "Do you supply the business contracts?" Yes, but let me level with you. The business contracts are the least of your concerns. You can get them at any Staples store for $20.